We offer a solution for the search and identification of fraud on the Internet through the involvement of a broad community and its interaction that is based on the principle of Wisdom of Crowd. On our platform, anyone will be able to report fraudulent activities or their suspicions, and other users will check these reports. All users, who will conduct useful activities (investigate reports, verify issues, etc) will receive rewards. As a result, Internet users will receive a browser extension WatchDog, which will notify everyone about the dangers, if they visit a fraudulent website, etc. • To date, a smart contract, a platform and CryptoPolice Academy have already been developed. In late June, we will be ready to launch a demo version of WatchDog notification system, that will already capable to protect users from certain types of scams. • In April 2018, the CryptoPolice project took first place in the Riga Blockchain pre-accelerator. • In spring we signed a contract with the Riga Technical University. The Department of Information Technologies, with professor Jānis Grabis at the forefront, will support CryptoPolice team in simulation and development of multi level verification algorithm for our community. • Recently, we reached an agreement with Bitdefender (one of TOP-10 antivirus vendors with 500 million users around the world) about the interaction and partnership development. In the near future we will make a public announcement about this. According to a report published by the Center for Strategic and International Studies (CSIS), the annual damage inflicted by cybercrime to the economy is in the range of 375–575 billion USD. Our modeling, based on the Identity Fraud Study from Javelin Strategy & Research, shows that the annual losses from digital fraud amount to around $50 billion p.a., which puts it at around 8.7%–13.3% of the overall losses inflicted by cybercrime. In 2016, the worldwide revenues from sales of security software totaled $23.6 billion. The above data show that revenues of security companies have been growing alongside the increasing damage inflicted by cybercrime. These data help us arrive at the assumptions that we have used to correlate and calculate approximate value of the annual revenue in the anti-fraud software segment globally as being in the range from $2.0 billion to $3.14 billion. Our project - CryptoPolice, specializes in the fight against Internet fraud. Internet fraud is a special kind of cybercrime, primarily because it is carried out by abusing the trust of Internet users. That means that it is a more psychological threat than a technical threat. You can say that fraud is a kind of scam that hacks human trust and that is why the approach to identify such threats is very different. To date, anti-virus companies cannot fully detect fraudulent schemes, because they only use technical means of verification and as a result the damage that cybercrime inflict on society keeps growing and reaches $ 50 billion a year. The Wisdom of Crowd principle involves making decisions not by a small group of experts, but by an unrestricted community of enthusiasts who interact according to a certain algorithm and review each other's work. Because of this approach, it is possible to process a huge amount of information, as well as increase the quality of expertise. This algorithm is developed in partnership with Information Technology Institute of Riga Technical University led by Professor Janis Grabis. The prototype of this model can be found in the American Peer-to-Patent project, which successfully reformed the US Patent Office and proved the effectiveness of the Wisdom of Crowd principle. 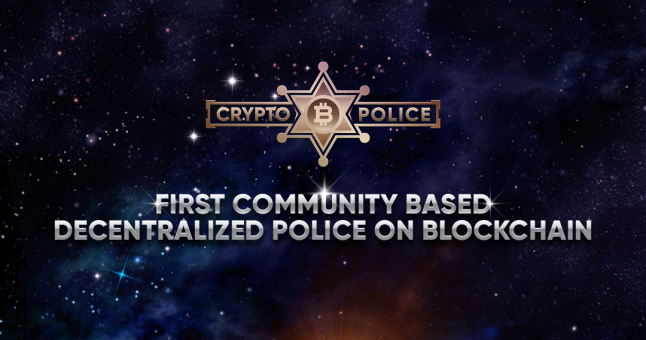 Thus, anyone will be able to report fraudulent activities or their suspicions using our platform, and other users, CryptoPolice officers, will check these reports. All users, who will conduct useful activities (investigate reports, verify issues, etc) will receive rewards..
As a result, Internet users will receive a browser extension WatchDog, that will notify everyone about the dangers, if they visit a fraudulent website, etc. In order to cover the risks associated with fraudulent ICOs, we propose to use a specially developed escrow smart contract that will allow to finance the project gradually, and in case of failure of key indicators - return the money to investors. While analyzing the problems of the Internet that are related to various kinds of fraud, we noticed that there are services in the market that already offer certain options for solving these problems. In particular, there are some services that deal with ICO project research, while others deal with the identification of phishing. A key drawback of all such services is that their judgment is entirely subjective, and users can rely only on the reputation of the service providers. The issue of trust remains open: important information may be falsified or hidden as the control over decisions is retained by the service owner. The Wisdom of Crowd principle + Reward system based on inner digital economics with the token. Powered by a unique mechanism to search and identify fraud threats, based on the principle of the “Wisdom of the Crowd,” WatchDog has few competitors in this segment and no complete substitutes for the mass market. By 2023, we plan to carve out a market share of 0.5–2% in this niche, enabling us to generate revenues of between $10.25 and $62.8 million p.a. - everybody who wants to earn additional income, utilizing their time and insights. We offer tokens on special terms and with an increased bonus - from 33% or more. The acquisition of stakes in the company must be discussed. Strict legislative regulation of companies operating in the field of crypto-currency.